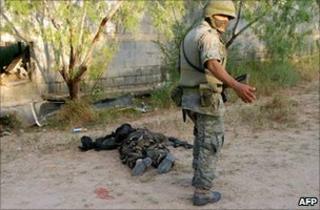 The Mexican army says it has killed 27 suspected drug cartel gunmen in a clash near the US border. A patrol came under fire as it approached an apparent training camp spotted during an aerial search over Ciudad Mier, the army said. Two soldiers were wounded in the fighting, in the state of Tamaulipas. In recent weeks Tamaulipas has been the scene of major violence between drug cartels competing for control of smuggling routes into the US. According to a statement from Mexico's Defence Department, the raid in Ciudad Mier was ordered after a military plane had spotted several gunmen in front of a building. When troops moved in, the fire-fight broke out. The military said three people, all believed to be kidnap victims, were freed during the raid. Twenty-five rifles, four grenades, 4,200 rounds of ammunition and 23 vehicles, including two painted to look like military vehicles, were also seized, officials said. Earlier, a military spokesman said the gunmen were believed to be on a property controlled by the Zetas, a powerful drugs cartel. The rival Zetas and Gulf cartels have been waging a bloody turf war in and around Tamaulipas, a border region which has seen an escalation of violence in recent months. The violence has worsened since the Zetas, a brutal group of former elite Mexican army commandos, broke ranks with the Gulf cartel, their former employers. On Sunday, the mayor of Hidalgo, a small town in the western part of the state, was killed in a gun attack on his car. His four-year-old daughter was also wounded. Hidalgo borders Nuevo Leon state, where the mayor of another small town was found murdered on 18 August, the suspected victim of local police allied to a drug gang. The rising violence has led to growing criticism of President Felipe Calderon's military crackdown on Mexico's drug gangs. Opposition groups say the crackdown, which began three and a half years ago, has done nothing to stop the flow of drugs to the US. "The capture or killing of important criminal leaders has made the crime organisations more desperate," Mr Calderon said. "It is an ever more bloody war between organised crime groups fighting for territory, markets and routes." "If we want a safe Mexico for the Mexicans of the future, we must take on the cost of achieving it today," he said.